Spread the almonds on a large baking sheet and bake for 7-8 minutes or until lightly browned and fragrant. Transfer to a bowl and cool completely, about 10 minutes. In a small saucepan over low heat, bring about 2 inches of water to a low simmer. Combine the chocolate and cinnamon in a bowl and set it over the pan, stirring, until the chocolate has melted, about 3-4 minutes. Remove from the heat and stir in 3/4 cup of the almonds and 3/4 cup of the dried cranberries until coated with chocolate. Pour the mixture onto the prepared baking sheet and spread into a 12 x 9-inch rectangle. 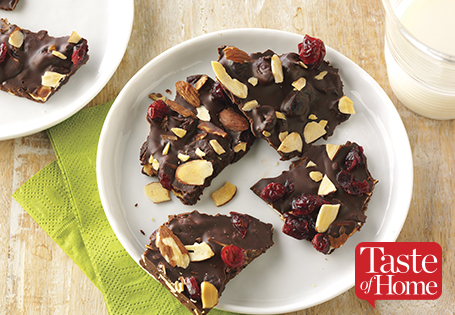 Sprinkle the remaining almonds and dried cranberries evenly over the top of the chocolate. Refrigerate until firm, about 1 hour. Cut or break the bark into about 48 smaller pieces. Keep chilled until ready to serve.